Now you have purchased your Paul McAuley Bodhrán its time to start and master the art of playing it. 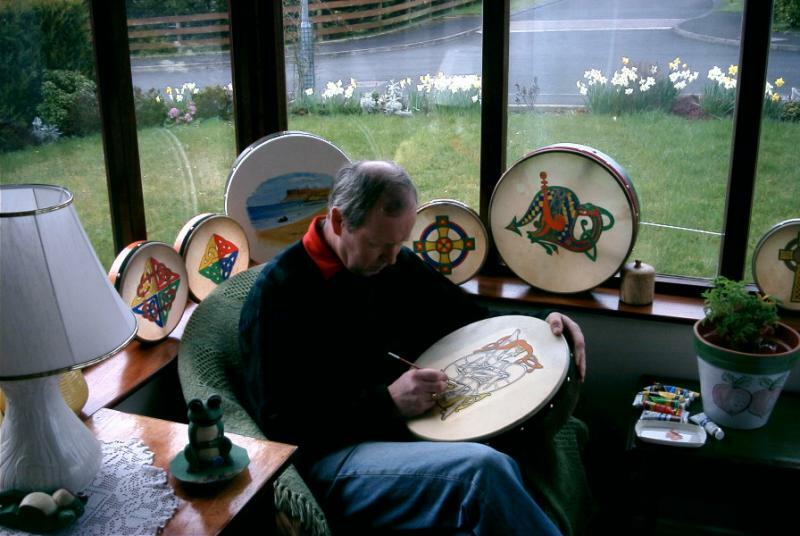 Like most things in Ireland, the origins of the Bodhrán have been lost in the mists of time. The drum was invented many years ago in Ireland and metamorphosis from a work implement to its present state of art. It arrived in Ireland from abroad, between one and two thousand years ago. The name itself when translated means “that which deafens”. It is derived from an Irish word “bodhar” which can be translated as “dull sounding” and it is natural to assume that the name was given directly to the instrument because of the sound that comes from it. Pronouncing the name of the instrument can be quite difficult for people not familiar with the Irish language. The two main ways of pronouncing it are: “BOUGH-RAWN” and (B) “BO-RAWN”. To get round this problem some people simply call the instrument a drum, others refer to it incorrectly as a tambourine. Whatever you call it, the bodhrán has a place in Irish music today which is without doubt a great one. treating, it is stretched across the frame and affixed by tacks. It may have a cross-piece or single-bar inserted, depending on if its a fixed skin or a tuneable bodhran and the bar will serve the dual purpose of easy handling and an aid to tension. The single-bars fitted to any tuneable can be made to be removed, if required by the individual player. When ordering a tuneable please specify if you want a single-bar or not. The other essential piece of equipment is the stick or beater. These come in all sized and are made from a variety of woods and differ greatly in weight. It is essential the player find a beater to suit, as there is nothing worse than a beater that is too long, too short, too heavy or too light.